Graduated in University of Industrial Arts Helsinki in 1978. Job description in VTT: 1.4.2000-30.4.2012 After being the project manager of international projects of UIAH (University of Industrial Arts Helsinki) in the department of Graphic design (in cooperation with VTT) Kuukkanen changed to VTT Information Tehnology as research scientist and project manager in 1.4.2000. Kuukkanen works on the domains of product information management, Internet technology and user interface design. Hannu Kuukkanen belongs to the classification group assigned by VTT and JUKO A204. Classification and salary grade is affected, not only by graduation but as well the professional expertise of the domain. Hannu retired from full term of service in 2012. VTT projects: Sisukauppa (Tekes/kansallinen 2000 - 2001) as research scientist, Internet technology on the domain of furniture trade in e-business XVisu, (VTT own funding 2001) as the project manager. Utilization of the augmented reality in maintenance purposes. Tuotejalo (VTT own funding 2001) project manager. Intelligent data maining in e-business utilizing sematic information models and ontology. Virtual-Hiisijärvi (ordered project 2002 on cooperation with Kajaanin kehittämiskeskus) as the project manager. This was a preparational project on the utilization of IT-technology for turism. Interiore XML = Interiore.net (Tekes/national 2001-2002) as the project manager. Information classification and semantic product information models for the interior industry domain e-business. Virike (Tekes/national - 2003) as the reserach scientist and team leader. The team made reserch on the new user interfaces for Digi-TV. The project studied the utilization of IT technology and web-services for ageing and disabled persons. OtaDigi (DigiTV test platform, VTT/TKK/OUBS, funded by partners 2003-). Main interest in development of Digi-TV-user interfaces. TIVIK (Tekes/national 2003) user interface development. Utilization of the barrcode in product information management in e-business. PAPERIXI (Tekes/national 2003) user interface design. This project made reserach on the modelled product information management of the paperindustry. LIFEPLAN (Tekes/national 2003) user interface design. The life cycle of the building. Service Life Planning - from theory to practical processes. CADPIPE, (EC Craft/international 2004-2006) Research scientist and project manager. Good quality 3D Cad data transportation and opimization for real-time rendering in virtual spaces and simulation. "CAD Production Pipeline". Hannu Kuukkanen has participated as well in several "secret" industrial projects as project manager and reserch scientist. Confidential posts: Kuukkanen has participated in OtaDigi (VTT/TKK/OUBS) Digi-TV reserach platform on the Otaniemi district) as the chairman of the content production work group from the year 2003 - 2012. Public lectures during the time in VTT: - Digi-TV lecture in the Helsinki University of Technology 2003 Digi-TV-user interface for ageing and disabled people. (about the Virike-research) - University of Helsinki and the Association of the artificial intelligence in Finland (Suomen Tekoälyseura), Semantic Web Kick-Off in Finland 2.11.2001.: Semantics on the interior domain e-business -(Lahden Kauppiaspäivät) Furniture sector Shopkeeppers Day in Lahti 9-10.3.2001: Interiore.net, the common product information model for the interior domain. The ontology and product information models of the domain.. - (Huonekalukauppiaitten liitto r.y.) The association of the Finnish Furniture Traders in 2001 lecture in Pöyrytalo. Possibilities in utilization of the product information models and constructed information in the information exchange and e-business of the domain. PM&RG's christmas party seminar in 7.12.2005 Hannu Kuukkanen: "Taiteellinen luovuus ja teknologia", "Creative artist and technology". International Articles, seminaars and publications: - Articles On Experiences 4 Digital Media Games Pluggable 3d Stereographic By Markus Ylikeraelae And Kuukkanen VTT 2006 - STEREOGAMES is a trade mark for the StereoGames software applications and concept. project manager: Hannu Kuukkanen VTT Information technology, 2007 - CADPIPE 2004-2006 EU/CRAFT project coordination If you'll need some extra information about this project please contact VTT Information Technology Hannu Kuukkanen (project manager) - IONHome | Affective Computing for Ambient Assistive Living The Network of the Future [ICT2007.1.1] Name of the coordinating person: Hannu Kuukkanen email: hannu.kuukkanen AT vtt.fi - (Project preparation 2007) - Project: Product Models and Structured Documentation Product models - Hannu Kuukkanen - VTT Research and Development on the domain of the Content Engineering and ... Digital Media & Games, "Pluggable 3D Stereographic" by Markus Ylikerälä and Hannu Kuukkanen VTT - Project: Product Models and Structured Documentation Tuotejalo: Datamining in ... Hannu Kuukkanen - Articles On Experiences 5 Arts Experiences Color As Information Carrier In Immersive Virtual Reality Spaces By Kuukkanen Vtt And Aydin Ozturk Ici University Of Izmir 2007 www.elamystuotanto.org - DETECT-it Mobile Technologies Cluster Event 2005/01/19 Hannu Kuukkanen, VTT Technical Research Centre of Finland , Senior Research Scientist SME Co-research with Research Institute / Case VTT - Benefits to SMEs - New Scientist Technology Blog: 3D after the fact But Hannu Kuukkanen of StereoGames tells me the technology has already been licensed to Italian company Mobile Solutions for a 3d version of this two-player table tennis game - NETS 1a morning coffee: Review of the issues of collaborative networks (16.2.2005) Media related issues (e.g. digiTV), Hannu Kuukkanen, VTT - Newsletter 01 | 2007 Stereo picture by additional application "New 3D technology gives old games new lease of life", Hannu Kuukkanen - International Conference On Rapid Prototyping And Manufacturing In Finland 9.2006 Hannu Kuukkanen,. VTT Virtual Models and. Interfaces. CADPIPE, the CAD Production Pipeline - 9. IFF-Wissenchaftstage 2006. Sequenz 2 - 22 Juni 2006 Anwendungen des Virtual Engineering Virtual Engineering benefits from the proper display of simulation results. Timo Tossavainen, Jukka Rönkkö, Hannu Kuukkanen Interviews: - New Scientist Technology Blog. Friday, February 16, 2007 "But Hannu Kuukkanen of StereoGames tells me the technology has already been licensed to Italian company Mobile Solutions for a 3d version of this two-player table tennis game". Hannu graduated in the University of Industrial Arts Helsinki department of Visual Communication in 1978. He made his final report about the Reproduction of Colour. From 2001 Kuukkanen has done a long day as a lecturer in the Web design, electric media and DTP color handling in the University of Industrial Arts Helsinki. 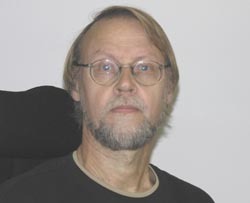 Short description about his work as the graphic artist and his role in the start of the Web-media in Finland will be found behind this link. EU Projects before VTT: - MTL's Adfora/EU -project in 1998  1999 as a project member. PostPresSim/EU (as tutor and project manager UIAH - 2000), CustomDP/EU (as tutor and project manager UIAH 2000-). Public lectures before VTT: "Kartografian seura 50 vuotta- seminaari" "Chart Graphics Association 50 years seminar. "Karttaa tarvitaan aina" "You'll allways need a map". 18.2.2000. In cooperation of ProGIS ry Digitaaliset paino- ja prepresmenetelmät karttatuotannossa . lecture of WWW-tuotteidensuunnittelu . "WWW-product design"- Hannu Kuukkanen, Mainostoimisto HPV. 02/25/2000 Lectures, seminars and teaching: Tieto 95 (WWW-graphics), TechNet seminar -95 (WWW-advertising and marketing), The Associaton of Finnish Advertising Agencies "Aamutori" (WWW-marketing cases). Consulting business: The Central Bank of Finland, a lecture in the DTP-colour handling and Webmaster seminar-96. Kuntaliitto (The association of Finnish communal authorities), a lecture for webmasters and web designers in 98, 99 (www-graphics), Työterveyslaitos (Finnish Institute of Occupational Health) WWW-webmaster seminar lecture in WWW-graphics -95. Lectures in "Colour management in DTP technology" and "the Design in Electric media". As a tutor and project manager in EU projects around the hypermedia and DTP (Desk Top Publishing). Marketing Institute: tutoring web-cases in -96 and MG school, a series of lectures in web page design 98 - 99. Awards In WEB technogy: Hannu Kuukkanen's design "Photonet" won the European On Line's (EOL) The Best in Europe Web site award in 1998 Awards in Graphics Design: Best package of the year (Kullankeltainen toast bred - a serie including 3 different tastes) (1980? ), Finnboard News, International - best CR magazine of the year 1993, Sugar trade-mark contest the national stage - second prize (1970? ), NOKIA rubber boots - Suomen Kuvalehti the best advertisement of the year (1975? voted by readers). Other: - PM&RG/TKK Contact person: member: Hannu Kuukkanen; - Universty of Industrial Arts Helsinki (now part of Aalto university), Member of the Graphich Design department steering committe till 2000. Contact person with the Uiah Medialab, Crucible Studio. Participating in the VTT's Key Technology Activities teams in Security and Human Technology Interaction. Own eterprise: Managing director 1.1.1990 - 2000 CAG Käyttögrafiikka Oy (WEBCAG). Registered on the domain of graphic design and software (registeration date of the trade register 27.2.1990). This enteprise is not active at the moment. VTT/Markus Ylikerälä, Hannu Kuukkanen, Key Muurikka; Mono 3D stereo. Method for real-time stereo viewing of 3D games and content and stereoprocessing by double shoots of mono still camera and video shoots and real-time stereo processing from one camera video shoots. Stereo processsing of ready made 2D video content. Technology is supporting autostereo displays and any other stereo display technology. Project name "StereoGames"
Social media web site telling old stories of the Vartiokylä on Joomla-platform. GOOGLE finds: 592 hits by the search "hannu kuukkanen" web. 371 hits by "hannu kuukkanen" internet. 256 hits "hannu kuukkanen" vtt . 1 500 hits by "hannu kuukkanen" IT. 112 hits by "hannu kuukkanen" semantic. Filtered search "hannu kuukkanen" may give over 3 000 hits (containing just a fev mis hits). Hannu Kuukkanen likes photography in private. Travelling is nice. Latest travels in: Prague, Izmir, Ephesos and Rome. As a hobby I've built a doll house for my daughter, renovated of our old suburban house built in 1946 and assisting in building own summer cottage as a carpenter as one of my summertime hobbies.